With private information that a railroad would be built over the prairie lands of Coffey County several miles south of the river and that the station would be located in the center of a section of land then owned by the Santa Fe Railroad Co., a Mr. Jones immediately bought the N.E. quarter of the section and divided the west 80 acres into a townsite, the north 40 acres being called Lebo. 1883 and \\\'84 saw many business places and residences erected. 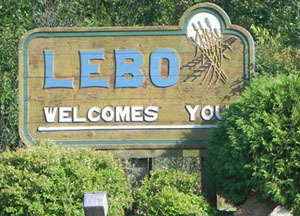 Lebo is located right along Interstate Highway I35, five miles west of Highway 75, and 20 miles northwest of Burlington. While visiting Coffey County you\\\'ll enjoy the historic points of interest in Lebo. If morality was disregarded by some elements of society, those who chose to flout the law often wound up in places like this, the old jail at Lebo.